where the winner will get 20% of the profits, a free tee shirt with your design/slogan, and a free subscription to The Fantasy Man FEED which will be my new "Premium" content. Phase 2: We'll pick the 5 finalists on February 17th. You will then have until February 28th to vote on the best t-shirt idea! Phase 3: The winning shirt will be printed and sold on http://www.fanthreads.com/ . You get 20% commission, you get to model your shirt on the site, and you get a FREE subscription to The Fantasy Man FEED! 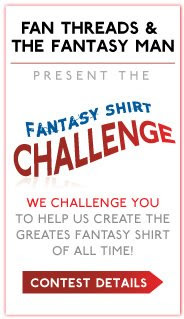 For rules, winnings and information go to Fan Threads and read up on how to submit your design/slogan to create the winning fantasy t-shirt!